SAN FRANCISCO — The Asian Heritage Street Celebration is back and bigger than ever, this year showcasing the Faces of Asia Cultural Procession, a dazzling display of ethnic attire with over 200 participants. Chef Martin Yan drew a huge crowd during his cooking demo last year. For the first time ever, all procession participants will have the chance to win cash prizes for categories including: largest contingent, most spirited contingent, best musical contingent, most colorful contingent, and best representation of an Asian legend, myth or tradition. The public is also encouraged to come to the festival dressed in ethnic attire throughout the day. The AHSC will showcase the return of the Arts and Crafts World Market, an extravaganza of unique hand-made products and artworks and a scrumptious collection of pan-Asian delights and sweets, along with the Bay Area’s favorite food trucks. Popular returning features for people of all ages include cooking demos by celebrity chefs (including Martin Yan), a children’s area, a healthy living pavilion, free film screenings hosted by Center for Asian American Media, along with performances by Asian American artists, DJs, and martial arts experts. The fair will also offer free hepatitis B screenings. The Arts and Crafts World Market will showcase the best and most creative Asian-themed arts and crafts items. All vendors will be carefully juried and shoppers can expect to find the highest level of hand-crafted goods. 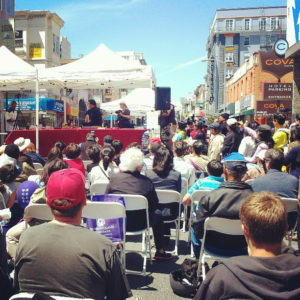 The ninth annual AHSC will be held Saturday, May 18, from 11 a.m. to 6 p.m. in front of the Asian Art Museum, Larkin and McAllister streets in San Francisco’s Civic Center, leading up to the Little Saigon district. The event is free and open to the public. For details, visit www.asianfairsf.com. To kick off Asian Pacific American Heritage Month, Subaru of America Inc. announced its return as co-presenting sponsor of the AHSC. Subaru will be on-site with the all-new 2014 Forester XT, popular San Francisco-based DJ Vinroc, and a chance to win audio gear from Subaru audio provider Harman Kardon. Performance car enthusiast Ali Afshar and his modified twin turbo BRZ will also be at the Subaru booth. Subaru’s Hep B Hero Mobile. The relationship between Subaru and the AsianWeek Foundation began in 2009 when the automaker donated a specially-wrapped Subaru Legacy sedan to support the foundation’s Hep B Free campaign. 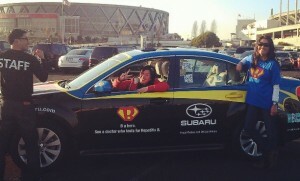 The donated vehicle, now known as the “Hep B Hero Mobile,” has traveled all over the Bay Area to raise public awareness for hepatitis B, which affects one in 10 Asian Pacific Islanders. The third annual AHSC Cinema Showcase will be held from 2 to 4 p.m. in the Asian Art Museum’s Samsung Hall. Admission to the museum will be free all day and there is no additional cost to watch the films. From emerging talent to celebrated media pioneers, this collection of short films and music videos reveals the vibrant Asian American media arts scene in the Bay Area. The program includes official selections of 2013 CAAMFest, films chosen by 3rd i Int’l South Asian American Film Festival programmers, and music videos by outstanding musicians who will be playing live on the festival’s main stage. From touching animations to exciting action flicks, there is something for everyone. The lineup includes Michelle Ikemoto’s “Tule Lake” (7 minutes) at 2:48 p.m. From San Jose State University, this stunning animation short is about a Japanese American woman held at the Tule Lake segregation camp with her family during World War II. Vancouver-based artist Wanting Qu reached stardom in China with her recently released album, “Everything in the World.” Her song “Drenched” topped the charts for weeks. Her album was recognized as the 2012 Best Album of the Year at the Beijing Billboard Music Newcomers Festival, and Qu was honored as Outstanding Regional Artist at the 12th Chinese Global Music Awards. She is currently recording her first full-length English album, due out next year. Qu left her family and China when she was 16 and entered Canada as an international business student. It wasn’t long before she realized her true passion and dream was to become an influential recording artist. She will be performing around 2 p.m. at the Civic Center Stage located at Fulton and Larkin streets.